where the first uncertainty is statistical and the second is systematic. These represent the most precise lifetime measurements in these decay modes. In addition, ratios of these lifetimes, and the ratio of the decay-width difference, ΔΓ d , to the average width, Γ d , in the B 0 system, ΔΓ d /Γ d = −0.044 ± 0.025 ± 0.011, are reported. All quantities are found to be consistent with Standard Model expectations. I.I. Bigi, The QCD perspective on lifetimes of heavy flavor hadrons, hep-ph/9508408 [INSPIRE]. N. Uraltsev, Heavy quark expansion in beauty and its decays, hep-ph/9804275 [INSPIRE]. U. Nierste, CP asymmetry in flavor-specific B decays, hep-ph/0406300 [INSPIRE]. 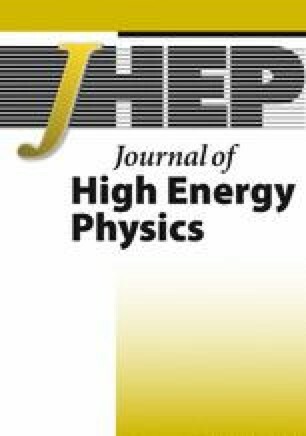 Heavy Flavor Averaging Group collaboration, Y. Amhis et al., Averages of b-Hadron, c-Hadron and τ -lepton properties as of early 2012, arXiv:1207.1158 [INSPIRE]. Updated results and plots available at: http://www.slac.stanford.edu/xorg/hfag/. A. Lenz and U. Nierste, Numerical Updates of Lifetimes and Mixing Parameters of B Mesons, arXiv:1102.4274 [INSPIRE]. LHCb collaboration, The LHCb Detector at the LHC, 2008 JINST 3 S08005 [INSPIRE]. A.A. Alves Jr. et al., Performance of the LHCb muon system, 2013 JINST 8 P02022 [arXiv:1211.1346] [INSPIRE]. R. Aaij et al., The LHCb trigger and its performance in 2011, 2013 JINST 8 P04022 [arXiv:1211.3055] [INSPIRE]. Particle Data Group collaboration, J. Beringer et al., Review of Particle Physics (RPP), Phys. Rev. D 86 (2012) 010001 [INSPIRE], and 2013 partial update for the 2014 edition. O. Callot, FastVelo, a fast and efficient pattern recognition package for the Velo, LHCb-PUB-2011-001 (2011). Y. Xie, sFit: a method for background subtraction in maximum likelihood fit, arXiv:0905.0724 [INSPIRE]. D.M. Santos and F. Dupertuis, Mass distributions marginalized over per-event errors, arXiv:1312.5000 [INSPIRE].